Everyone knows hearing loss can cause life to be difficult. Not being able to hear your loved ones clearly, having to turn the T.V. way up, not hearing certain sounds that might prevent an accident from happening. The list can go on and on…. but what if I told you early treatment of hearing loss could help prevent serious health issues? Not many people understand this, so they go way too long with hearing aids (Sometimes because it makes them look old) only to age faster because they did not. We understand, there is definitely a social taboo associated with wearing hearing aids, but that mindset is causing health issues in Americans. According to studies, most people do not correct their hearing impairments until 10 to 20 years after they notice there might be an issue. Other studies are also showing there is a link between hearing loss and brain functionality. These studies show that if your brain has to work to understand what you are hearing, then it does not give the same effort into the cognitive processes (what your brain does to learn and memorize information). Experts believe this may be leading to an earlier diagnosis of Alzheimer’s and dementia for people who ignore their hearing problems. 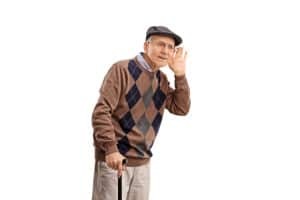 These studies show why the “hearing aids are only for very old people” stereotype needs to stop, because they are actually keeping people’s brains healthier, younger, and more sharp. The signs of hearing loss can be subtle and emerge slowly or early signs of hearing loss can be significant and come about suddenly. Either way, there are common indications and hearing impaired signs. You should suspect hearing loss if you experience any of the signs below. Have difficulty following conversations involving more than two people. To schedule an appointment with the Ear, Nose and Throat Institute, please call 770-406-6587 if you are in the Atlanta area, including East Cobb and Buckhead.